U.S. President Barack Obama delivers remarks at a business leaders forum in Dar es Salaam on July 1, 2013. In Ethiopia, the government has systematically closed space for peaceful dissent over the past decade. In 2009 it passed a draconian law regulating nongovernmental activity which bars work on human rights, good governance, conflict resolution, and advocacy for the rights of women, children, and people with disabilities if organizations receive more than 10 percent of their funds from foreign countries. The country’s most reputable human rights groups closed or scaled down their operations. The government has also used a 2009 counterterrorism law to arbitrarily detain and prosecute dozens of journalists, protesters, and political opposition leaders. Most recently, in July the police charged three journalists and seven bloggers known as “the Zone 9” collective after they wrote articles calling for reforms and peaceful opposition to government policies. They were charged with having links to banned groups under the anti-terrorism law. In Rwanda, almost no independent voices are speaking out. Journalists and activists who criticize the government of President Paul Kagame have been threatened, prosecuted, imprisoned, forced into exile, and even murdered. A few weeks before the 2010 presidential elections, Jean-Léonard Rugambage, a journalist with the independent newspaper Umuvugizi, was shot dead outside his house in the capital, Kigali. He had been investigating sensitive cases, including the attempted murder of a prominent government opponent in exile. In Burundi, President Pierre Nkurunziza’s government has increased its harassment of human rights activists and other critics. In May, Burundi’s most prominent human rights activist, 66-year-old Pierre Claver Mbonimpa, was arrested and charged with endangering state security and using false documents. The government has blocked protests over his arrest and prohibited broadcasting of a song about Mbonimpa. In Uganda, President Yoweri Museveni’s 28-year tenure features increasing suppression of basic rights. The government has threatened groups working on a range of issues, including corruption, land, oil, and good governance. A 2013 public order law gives police wide discretionary powers over whether to allow public meetings. President Teodoro Obiang Nguema Mbasogo of oil-rich Equatorial Guinea has been in power for 35 years, longer than any other African head of state or non-monarch in the world. Obiang’s government is characterized by corruption, repression, and torture. Conditions on the registration and operation of nongovernmental groups are so restrictive that no independent human rights groups are able to register and legally function. The few activists who seek to address human rights concerns face intimidation, harassment, and reprisals. 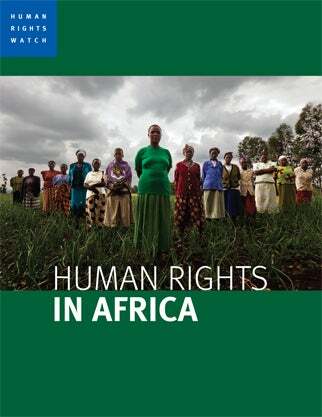 In Swaziland, there has been a drastic deterioration in respect for human rights in recent years. Political parties are banned, the judiciary is severely compromised, and an anti-terrorism law has been used to target independent organizations and harass civil society activists. On July 25, Bhekithemba Makhubu, editor of Swaziland’s monthly news magazine The Nation, and a human rights lawyer, Thulani Maseko, were sentenced to two years in prison following an unfair trial after The Nation published two articles by Maseko criticizing Swaziland’s chief justice. Similar restrictive practices against nongovernmental organizations and independent media have been used in the Gambia, Somalia, Chad, and Cameroon, all of whose leaders are expected to attend the summit. Three other repressive African leaders – Zimbabwe’s Robert Mugabe, Eritrea’s Isaias Afeworki, and Sudan’s Omar al-Bashir – have not been invited. The Obama administration said that their governments were not “in good standing” with the United States. Central African Republic Interim President Catherine Samba-Panza has also not been invited because the country has not yet held elections necessary for it to be readmitted to the African Union, among the criteria for summit participation. In much of Africa, endemic corruption and weak judicial systems routinely undermine citizens’ rights. The judiciary, which could mitigate some rights abuses in many African countries, is neglected or manipulated, allowing a dangerous culture of impunity to take hold. Those responsible for serious human rights violations, corruption, and state-sponsored repression are rarely investigated and held to account, leaving victims with little hope for legal redress.